48 photos of a rare winter steam charter from St Polten to Mariazell. Welcome to the Mariazeller Railway (MZB)! St Polten, Austria, Mon 2 February 2015. This electrified 84km narrow gauge (76cm) railway runs south from St Polten, on the Vienna - Linz main line, to the important pilgrimage centre of Mariazell. It is single track, and has two distinct sections. From St Polten to Kirchberg an der Pielach (31km) it follows the valley floor as it climbs from 273 to 372m. South of there it becomes a real mountain railway, steeply graded and sharply curved, with viaducts, tunnels and horseshoes. It reaches a summit of 891m at Gosing (67km) before descending to Mariazell (849m). The railway opened in 1907 using steam traction. It was electrified as early as 1911. The electric locos introduced then worked until 2013, when they were replaced by Stadler electric trains. 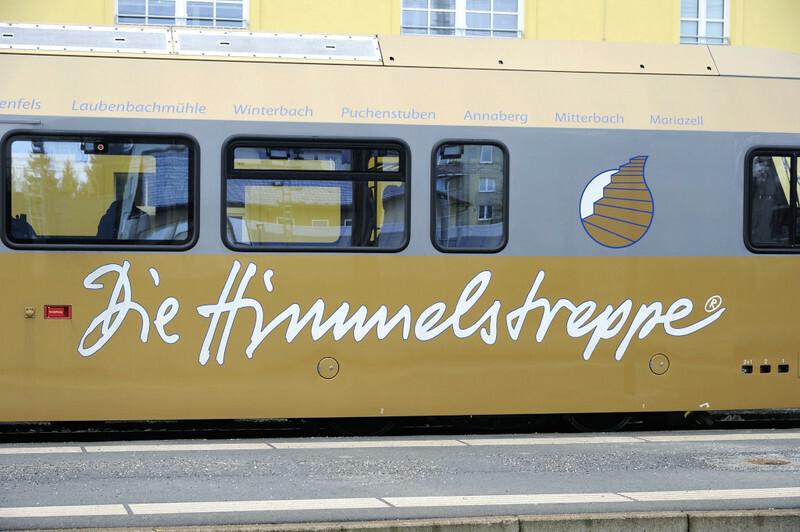 As seen on this Stadler coach, the new trains are branded Die Himmelstreppe (= Stairway to Heaven).